After watching George Romero's Diary of the Dead I wasn't quite sure that I was ready for another zombie movie shot in the handheld camera style. The idea behind Diary was a good one, I just felt a little underwhelmed by the whole experience although that opinion could change once I get to give it another viewing. Having seen the trailers for [REC] though I was convinced though that this would be an entirely different viewing experience, and once the closing credits had rolled I am happy to say that it was not only a different experience but it was a thoroughly engaging one too. The movie follows Angela, and her cameraman (our POV), as they record a TV show following the night shift at a local Fire Station in Spain. During the course of the night a call comes in that sends them heading off to an apartment complex where one of the residents has gone a little crazy and locked herself in her apartment. Upon arrival they find the rest of the complex's residents gathered in the foyer, all concerned as to what is going on upstairs. The firecrew, along with Angela, the police and Pablo's camera, make there way up to the apartment where upon entering find a bloodstained woman. Whilst trying to help the woman she attacks and bites one of the firemen and a policeman. Events take a turn for the worse when everyone inside the building finds out that they have been locked in on orders of the Health Authority. Naturally pandemonium ensues as everyone tries to work out what the hell is going on, why are they being kept here? And why are people attacking and biting each other? Shot entirely from the point of view of Pablo's camera [REC] is a tense and very exciting movie to watch, there are no opening credits, no accompanying soundtrack, just what is happening through the camera's eye, and it is all rivetting viewing. As the action unfolds I was continually impressed by the visual effects as well as the seemless editing, the only noticeable edits were when filming stops, only to continue moments later. Such was the intensity of the viewing it came across much less a movie and more like the news report that is intended with the style of film it is. The long takes allowed for some excellent, and no doubt thoroughly rehearsed, dialogue between the characters all of whom were played superbly by the ensemble cast. My only real flaws with the movie unfortunately come with the territory of this tyle of movie, you get a fair amount of shaky camerawork, especially when there is running involved, and some of the scenes were a little on the dark side, most noticeably towards the end. Nonetheless [REC] was an absolutely terrific movie from start to finish with some genuine scares that are helped no end by the clever camerawork and lack of aural warnings. A remake of this is on its way, and from what I have seen of the trailer it looks very much a shot for shot style of remake, so try and grab a copy of this first, I doubt you will be disappointed. If you can imagine a mix between The Blair Witch Project, Night of the Living Dead and Assault on Precinct 13 you might get an idea of what to expect from this movie. 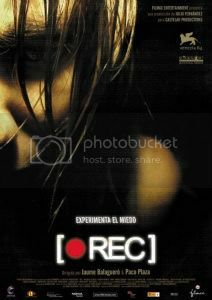 [REC] is an excellent movie that goes to show the documentary style horror film is far from (un)dead.